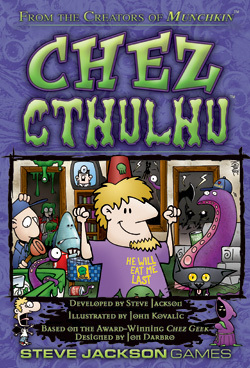 Chez Cthulhu brings the horror of Lovecraft's Mythos right into your apartment . . . as if the leftovers from the Pizza with Absolutely Everything weren't bad enough. Work your job â€“ will you be a Morgue Janitor, a Sanitarium Guard, or a Gravedigger? Buy things to give you Slack, like a comforting Straitjacket . . . or some Friendly Tentacles to make your day a little brighter. Invite people over to your room . . . and sacrifice them! And Nookie . . . don't forget the Nookie. Preferably without the Ectoplasmic Slime.